With the BBQ season kicking off in the northern hemisphere, I thought I would dedicate this week to giving you a few healthier options. Don’t get me wrong – I like a big juicy cheeseburger but it is good to have a lighter alternative too. This recipe is also perfect if you have vegetarians in your family. The addition of curry powder makes the vegetables burst with flavour. If you don’t have any curry powder in your pantry, you could use a combination of ground cumin and ground coriander, or even ready-made curry paste from a jar instead. I served my burgers with a dollop of mayonnaise and a little bit of lettuce. Finely grate both your zucchini and peeled sweet potato. Ideally do this with your food processor, but if you don’t have one then you can grate them by hand. Squeeze the excess liquid from the grated zucchini and sweet potato – you will be surprised how wet they both can be. Once the liquid is gone, place both vegetables into a large bowl along with the curry powder, garlic and flour. Stir to mix everything together evenly. Add the whisked egg to the bowl and mix with the vegetables. Use your clean hands to form the mixture into four burger-sized patties. Place the patties onto a plate and refrigerate for 30 minutes, or overnight if required. Heat your BBQ grill, or a large non-stick frying pan, to a medium-high heat. Cook the patties for 10-12 minutes, carefully turning every few minutes, until golden and cooked through. 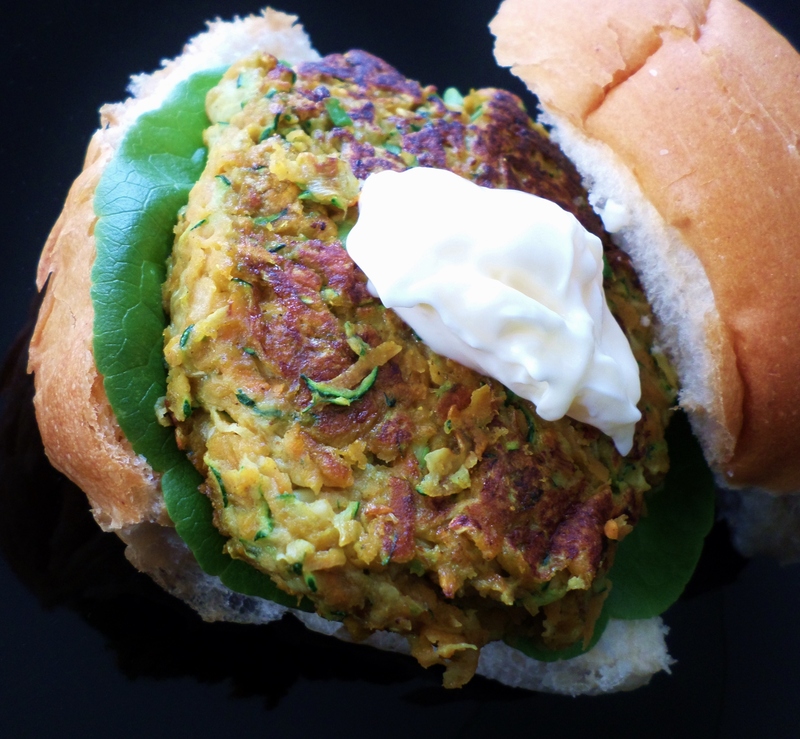 Serve your zucchini burgers in bread rolls with lettuce and mayo. 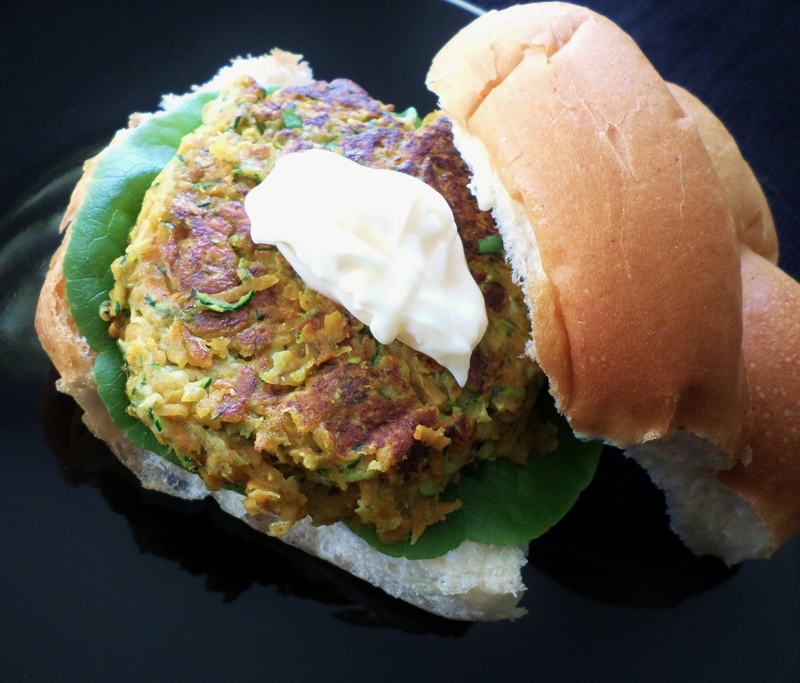 This entry was posted in Mains and tagged BBQ, Burgers, Food, Light meals, Potatoes, Recipe, Recipes, Sweet Potato, Vegetables, Vegetarian, Zucchini. Bookmark the permalink. Just made these for dinner. Absolutely Devine. Thanks for the post.